This is a wonderfully simple jacket that brings so much style and coolness to the table. 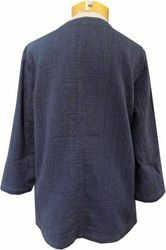 Eileen Fisher mixes her wonderful cotton/linen fabric in a gorgeous indigo blue, with an open front style, two front pockets and back seam detailing. The beautiful color is amazing popped with white, but we'll end up throwing this over so many great tanks and shells and it will kick everything up a notch (or 10).